I know I am a little slow on the trend... but I may have fallen in love with Ikea! Today was my first time not only going to the store, but even seeing what it has to offer! I have never looked through an Ikea catalog or anything of the sort. So I was surprised when I went there for the first time today and got to see all the many fun things it had to offer! My mom and sister took me so I could find a bookshelf for my room, and there were so many different styles and colors to pick from. I had so much fun wandering up and down the different sections, and seeing the different ways they showed the items in their showrooms and such. If you haven't been or seen any Ikea items, I suggest you do so quickly! i'm glad that you found one. i love ikea as well but did it give you a headache. Like the updated blog and i hope school is going well for you. 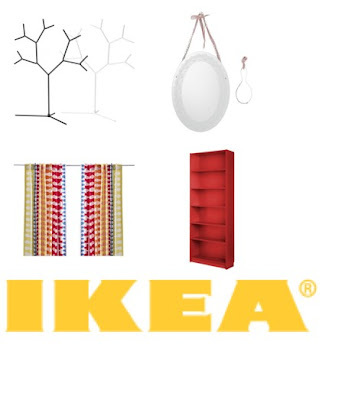 love the new blog...and i love ikea too-i could be in that store for hours and never get bored! how did you do your cute header and your pics that are on top of eachother? you really need to teach me how to be high-tech like you. loved shopping with you...let's do it again..